You are here: Home / Travel / What is the best way to get from Bangkok to Ayutthaya? What is the best way to get from Bangkok to Ayutthaya? Heading from Bangkok to Ayutthaya by train! Finally, a visit to one of my bucket list destinations in Asia! Visiting the Historic City of Ayutthaya (a heritage site!) 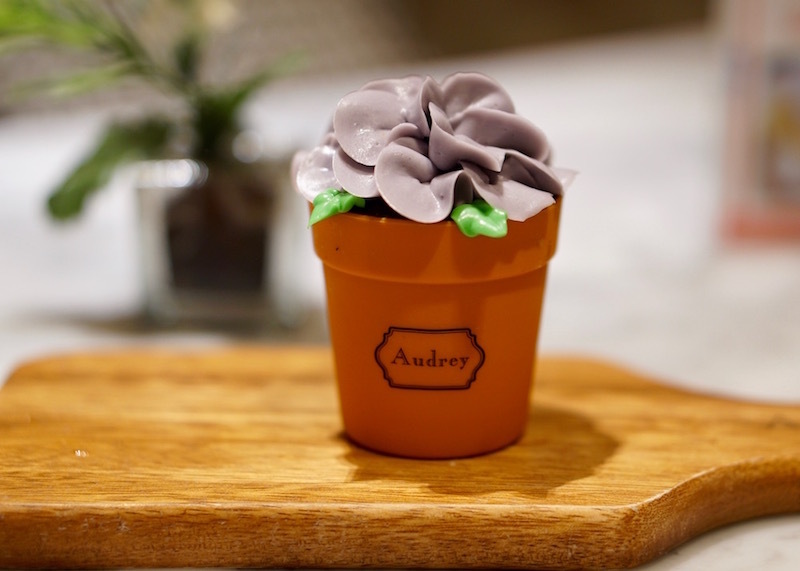 is a favourite for those travelling to Bangkok. 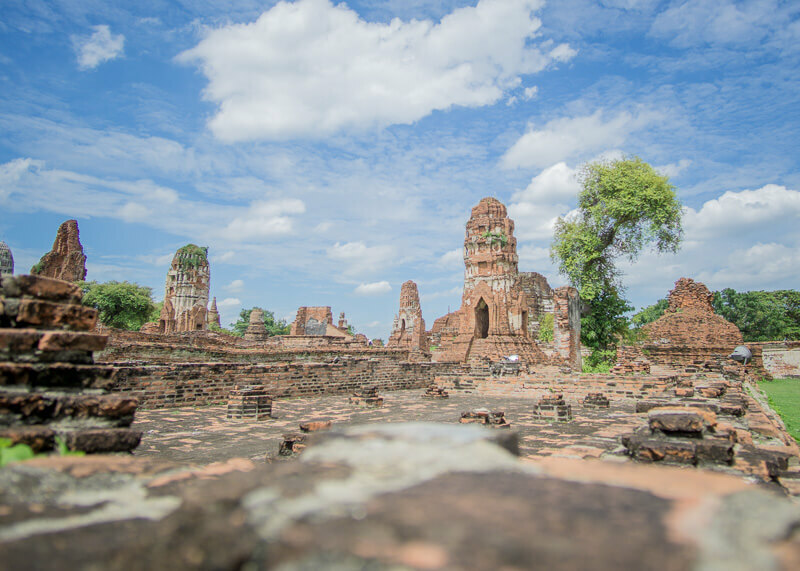 Considering how the old city is about 50 miles (80 kilometres) north of Bangkok, visiting Ayutthaya from Bangkok is easy and convenient. 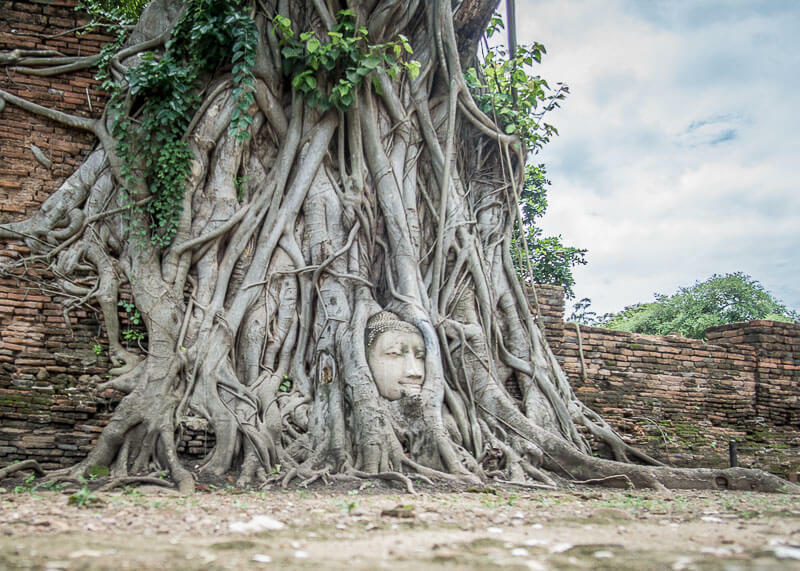 I’ve wanted to visit Ayutthaya for a very long time now – let’s say almost a decade of dreaming. While I’ve been to Thailand a few times before my year of slow travel, I saved Ayutthaya for when I had enough time to spend a few nights in the ancient city. 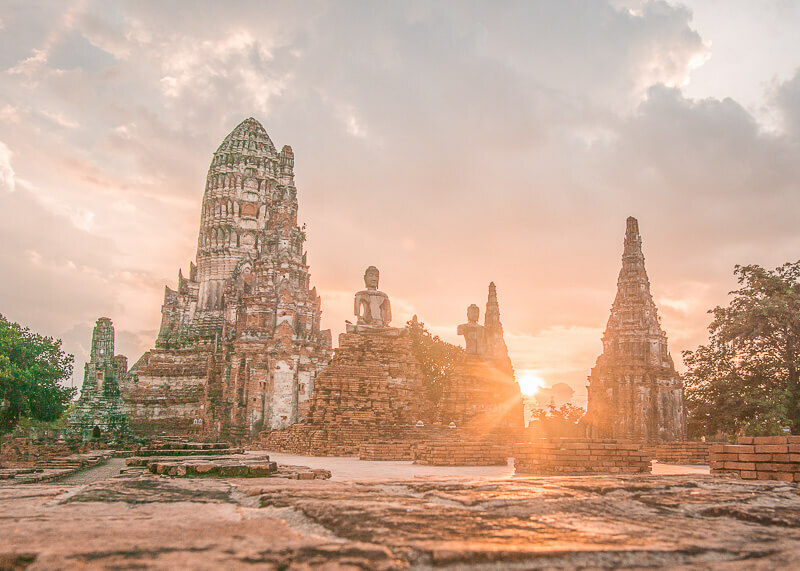 I tried planning for Ayutthaya the first few times I visited Bangkok but honestly reading about all the options left my head spinning and I gave up on trying to plan for Ayutthaya. If you are feeling the same way about deciding how to get from Bangkok to Ayutthaya, not to worry! I wrote this guide especially for you. 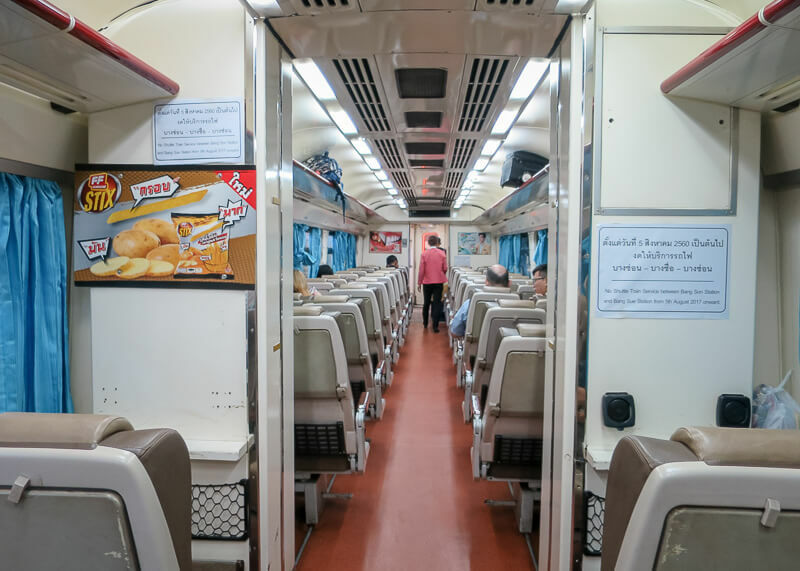 And while I walk you through the different options on getting from Bangkok to Ayutthaya, I am going to spoiler alert this post for you and say that train travel offers the most value if you plan it in advance. But let’s go back to step one and assume you know nothing about travelling from Bangkok to Ayutthaya and you need information to make an informed decision, shall we? 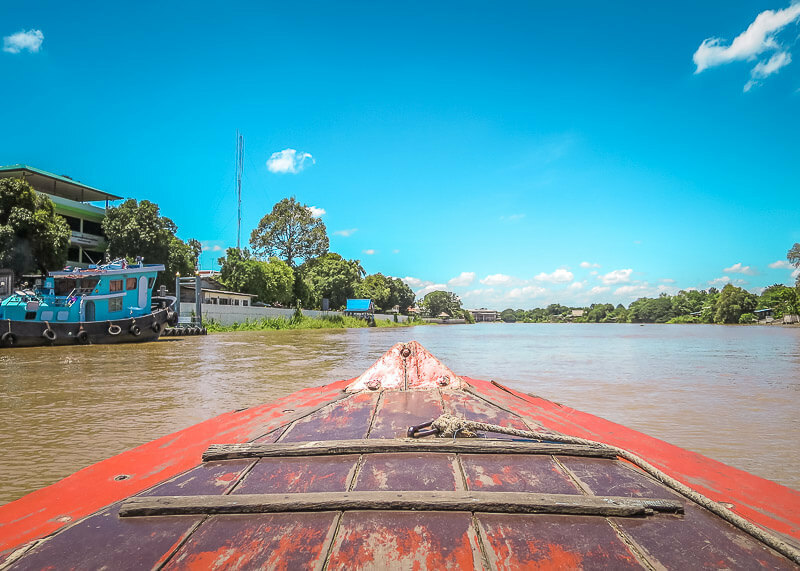 Once you navigate through the different modes of getting to Ayutthaya, travelling from Bangkok to Ayutthaya is a breeze thanks to its close proximity. 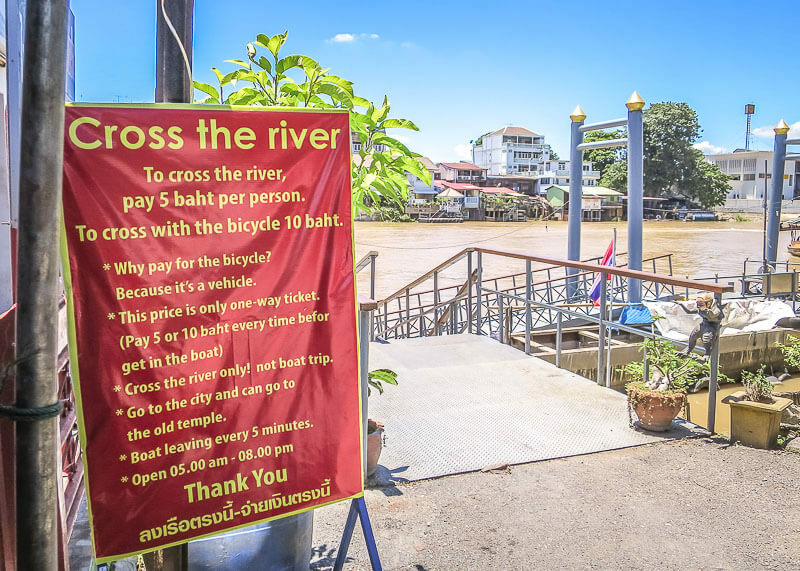 And lucky for you, I’ve made a guide to walk you through all the options on how to get from Bangkok to Ayutthaya, how to book tickets, prices, and some other things to consider before your trip. Click on this link to find Thailand Guides & Stories To Help You Plan Your Trip! Thanks to its proximity to Bangkok, there are only about a gazillion transportation options for Ayutthaya (ok, mainly six). 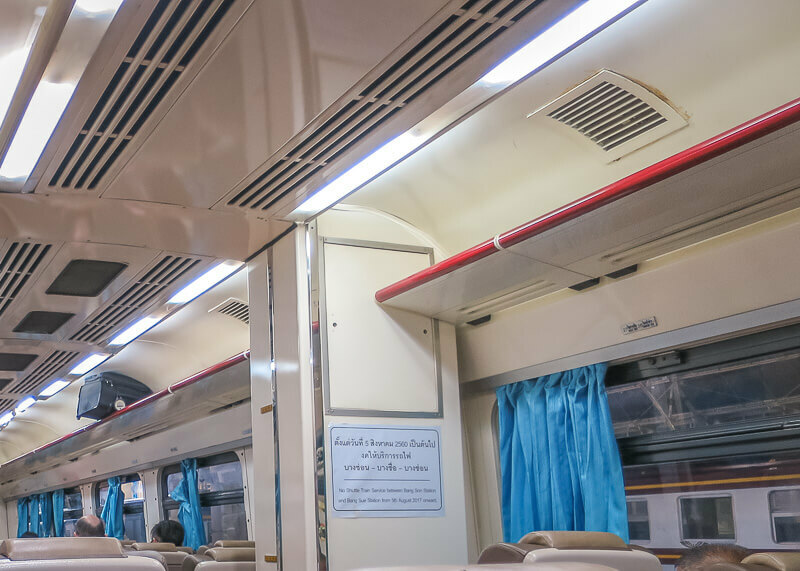 If you ask most travellers on how to get from Bangkok to Ayutthaya, you’ll find a unanimous agreement that train is the way to go. Not only is the train a cheap option, but it is a scenic ride, and it’s affordable. The only downside is that if you are tight on time, the train ride is the slowest option and there could be delays. 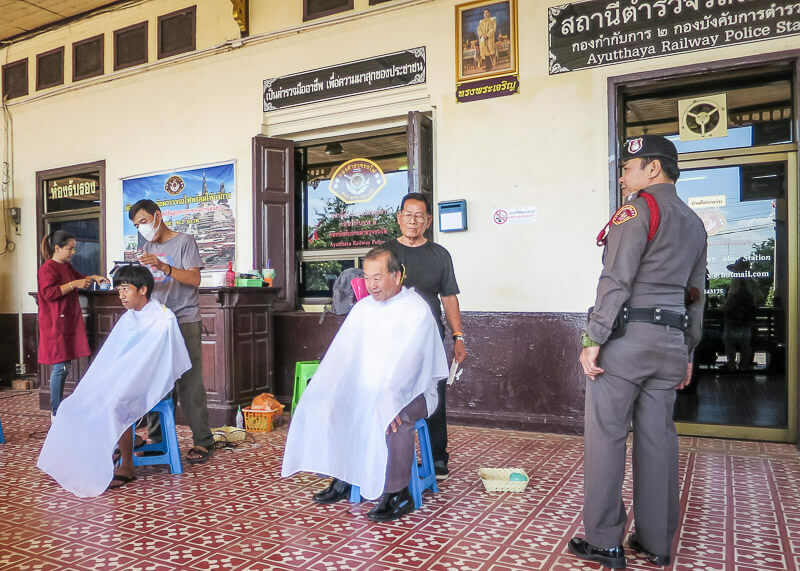 You can even get your haircut at the train station! Before travelling by train in Thailand during my five-month stay, I read online how Thailand trains are notorious for delays. I took the train on at least five separate occasions and never once did I experience a delay. Maybe I got lucky? Private car transfer is a great way to get to Ayutthaya as long as you find a reliable, safe and honest driver. 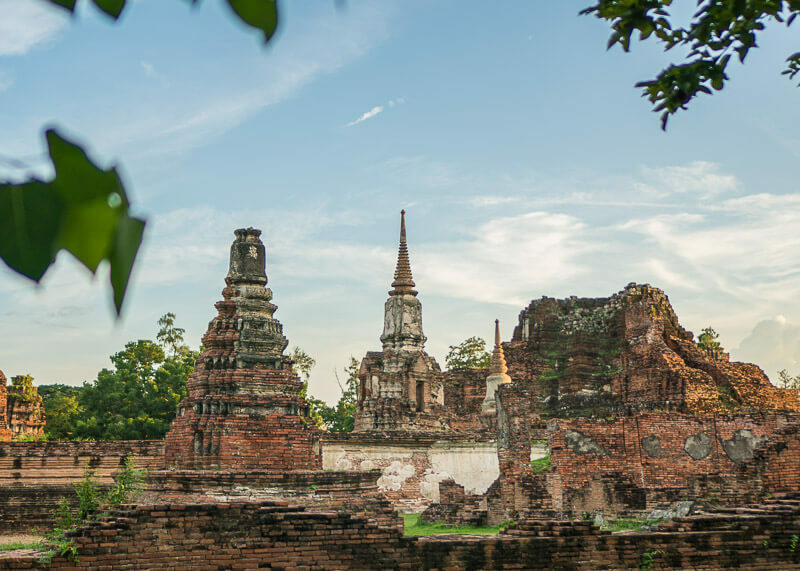 I mean, you get picked up, and you arrive at your destination, so you don’t have to worry about the logistics (continue reading about the other options to learn how getting to Ayutthaya requires some planning!). Price is the biggest con since it is expensive. However, if you can find more people to split the cost of hiring a car transfer, this option would be great for you. Click here to see more options on private transfers. While taxis are an option from Bangkok, I try to stay away from cab drivers, especially ones from Bangkok. If you want to learn my crazy experiences with Bangkok taxi drivers, click on this link and scroll down and read why I hate taking taxis in foreign countries (spoiler alert: the taxi breaks down on the highway as I am about to catch a flight from the airport. Classic). If you decide to take a cab, consider asking the hotel to book one for you and make sure you agree on a price before leaving. I’d like to think that since their reputation is on the line, they would find one that is a good and responsible driver. Is there air conditioning in the vehicle? How many seats are there in the car? Is there proper insurance? If so, what kind of insurance? How old is the car? Is it modern? Are toll fees included in the price? Are parking fees included in the price? Can the driver speak English? If you can find your way to the Mo Chit bus station, you can take a van from Bangkok to Ayutthaya. To find the minivans, you can ask around for directions or head to one of the counters for instructions on how to catch a van. Keep in mind that the minivan makes lots of stops, so don’t get off the minivan until you arrive at your last stop! I recommend that you have Google Maps so you know where you are going in case the driver can’t speak English. Once in Ayutthaya, you will be dropped at Wat Mahathat. If the price of the minivan is too much for you and you don’t want to take the train, the bus is another option to get from Bangkok to Ayutthaya. Keep in mind that it is a public bus, so you are sacrificing comfort and time. Do what the locals do and see Thailand by bus! 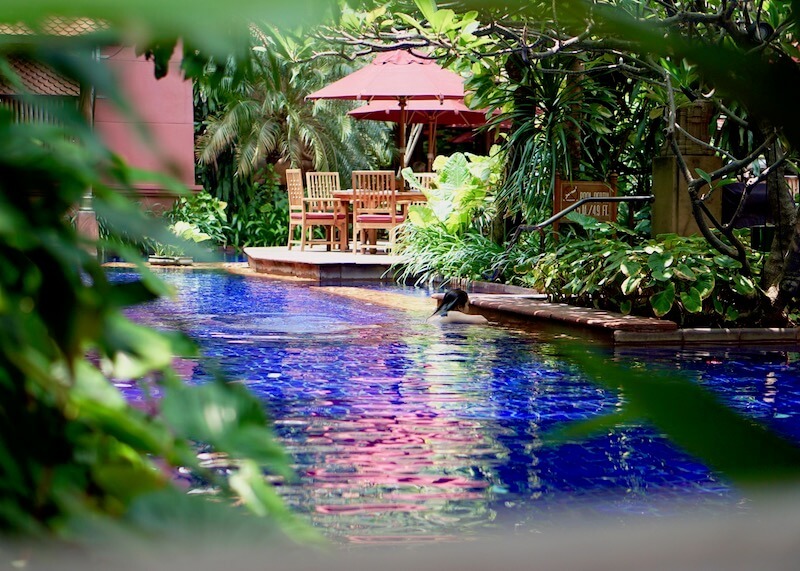 Which option should I choose from Bangkok to Ayutthaya? 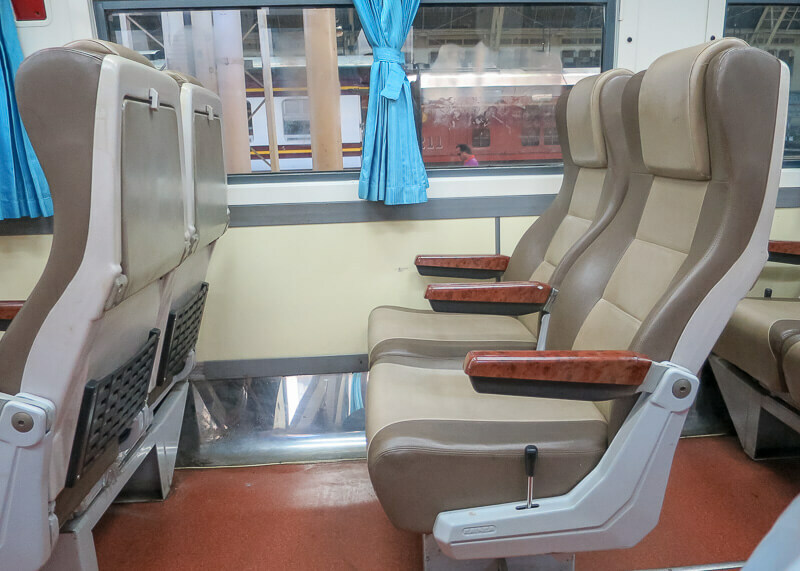 Once you start comparing your options, you’ll find that going from Bangkok to Ayutthaya by train offers the best value regarding comfort, price and duration. We choose the train because it was easy for us to get to the Bangkok train station and because ticket prices are pretty low. We also loved our first train ride to Bangkok during our stopover and wanted to continue exploring the country via train. Also, because I read that the train ride from Bangkok to Ayutthaya was a scenic one, we decided to go with this option. I won’t lie though; I don’t remember much of the scenery. I will say though, I was quite apprehensive about train travel in Thailand, mainly because I didn’t know what to expect. Up until this point, my only train travelling reference outside of North America was in Vietnam, and let’s just say that was quite an adventure. I was also pretty worried about the luggage situation, as I had a huge suitcase and a carry-on that needed to come with me because I was travelling for a year. How do I book tickets for the Bangkok to Ayutthaya train ride? Unlike the rest of our journey where we could buy our tickets in advance online, tickets to Ayutthaya are only available at the station. I’m not too sure why, but that’s something to note for when you plan your travels. So on the day of departure, we arrived at the train station at around 9 am, one hour before departure. Arriving just after 9 am is also ideal because you will miss the rush hour of people coming and going from the Bangkok train station. I read online that the wait to buy tickets can be long, but it took us under ten minutes to get our tickets. The lineups weren’t as bad as we had expected and we were able to get everything done in a short amount of time. What happens on the day of the Bangkok to Ayutthaya train ride? We arrived at the train station just after 9 am to get our tickets one hour before departure. Because our hostel was right next to the train station, we were able to walk to Hua Lamphong. However, if you are trying to figure out how to get to the Hua Lamphong Station, you can quickly arrive via the MRT (the Bangkok subway). All you need to do is find your way to the Hua Lamphong station, and it’s right next to the train terminal. I read online about potential scammers, so I avoided all the friendly people who tried to talk to me at the entrance. There are also posted signs around the train station in English warning travellers of people trying to pass off as employees of the train station so be careful! They might even give incorrect advice so make sure to ask all your questions with the personnel at the counter. Make sure to have a translation app handy to avoid misunderstanding. A few snacks later, it was time to head to the platform. The wait wasn’t very long since passengers need to board the platform 30 minutes before departure. As we made our way to the platform, our train was already there, and it was ready for us to get onboard. While delays are frequent, we didn’t experience any setbacks on our ride. The train left on time, and as soon as we were moving, an attendant came by to give us a meal, which was a surprise for us! Finally on the train to Ayutthaya! Our train was pretty empty with only a dozen other passengers onboard. The passenger car was not as new as the one we took from Surat Thani to Bangkok but was still in good condition. Again, I was super concerned about storage space on the train when I was planning this trip. One look at the area and I realized I made much ado about nothing. There’s so much space for your legs, luggage and everything you can imagine! Ok well, not really… but that’s still a lot of space! The seats are very comfortable with lots of space to recline backward. 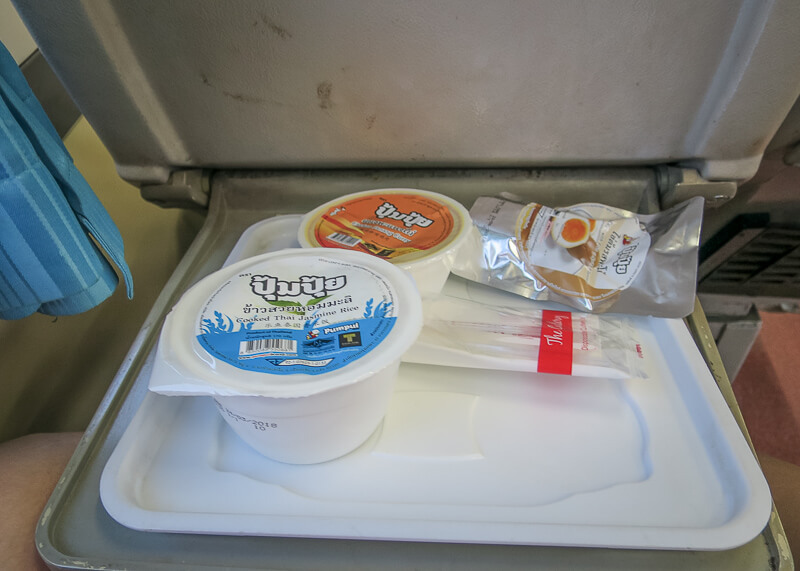 There is a tray in front of your seat that you can bring down for meals, writing, or other miscellaneous uses. Unlike the Thailand bus rides where there was zero warning to get off the bus, the train attendants were much more thoughtful. They always came by to give us a five-minute heads up to gather our things and leave the train. Arrived safely at the Ayutthaya train station! This station reminded me of the Surat Thani one, albeit a bit bigger and cleaner. Of course, there will be tons of tuk-tuk drivers chatting you up to see if you’ve booked a place to stay or if you want to use a tuk-tuk to get around Ayutthaya. We politely waved no and kept walking to our guesthouse. If you are planning a day trip in Ayutthaya, you can quickly get there by walking straight across the road towards the little ferry. The ferry cost is 5 baht per person. The boat really does leave every five minutes! Riding the ferry is very scenic and fun! Don’t be surprised if you have to dodge all the other tourists who are practicing how to ride the motorbikes. While you can walk around Ayutthaya to get to the major ruins, I highly recommend getting a bike as some of the temple ruins can be spread out. You can book a bike tour online by clicking on this link. 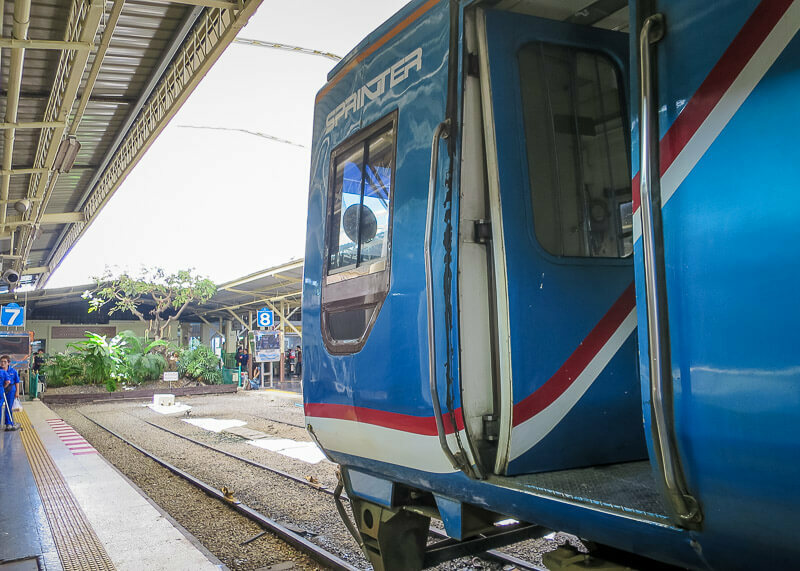 The train from Ayutthaya to Bangkok is easy to catch, and you can purchase your ticket at the train station. The first thing you might want to do once you get off the train is to buy your train tickets to Bangkok in case they sell out. Did I feel safe on the Bangkok to Ayutthaya train ride? I felt very safe on the train and was not worried about anything on this leg of our trip. It felt no different than the train rides that I took back home, save for the fact that it was in Thailand. Can you charge your phone on the Bangkok to Ayutthaya train ride? There are no places to charge your phone, but since this trip is under two hours, you won’t need to worry about battery juice. Is it easy to ask questions in English during the Bangkok to Ayutthaya train ride? The staff members on the train had good English and made sure to confirm our destination when we were on the train. As we got closer to Ayutthaya, an attendant gave us a heads up for us to start packing our stuff to get ready to leave. Is there food on the Bangkok to Ayutthaya train ride? Wait, what… Is food served on our trip? We had no idea until we boarded the train that food was included in our ticket! 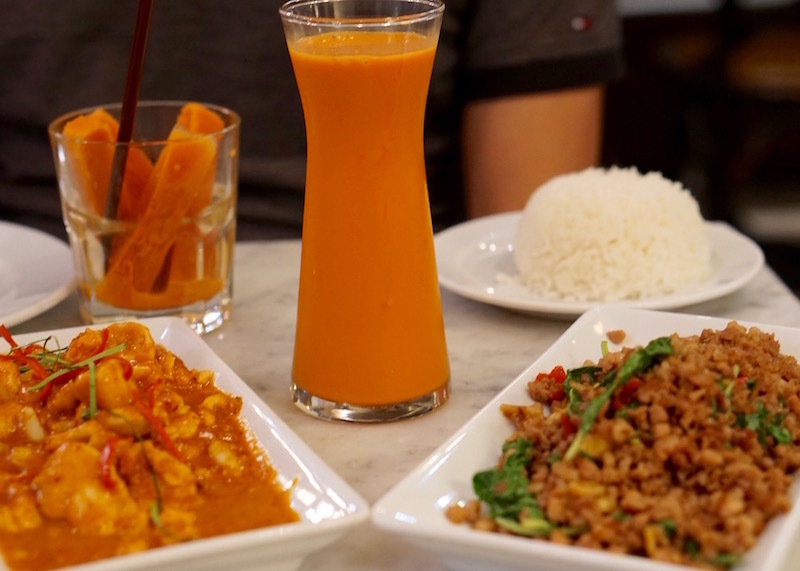 We each got a boiled egg, chicken Penang curry, jasmine rice and a cup of water. 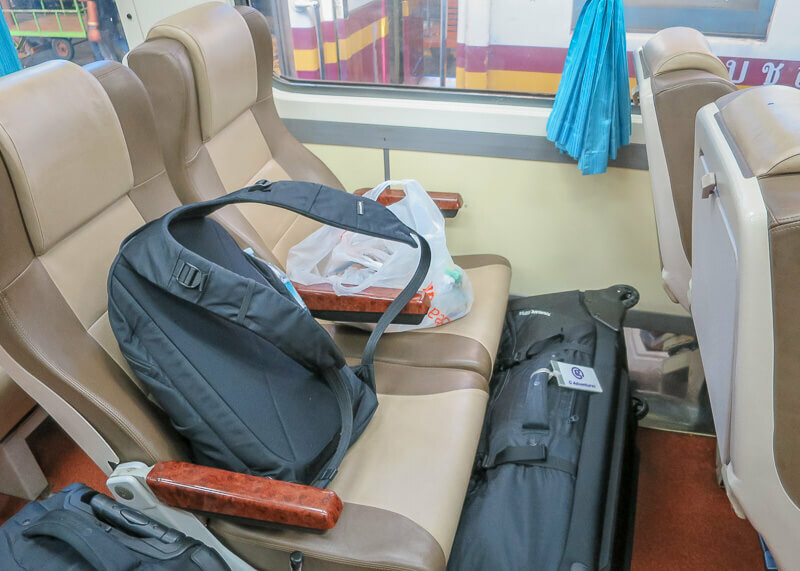 Where to keep luggage and storage options for the Bangkok to Ayutthaya train ride? Soooo happy with all the luggage space! No joke, storage space on the train ride was my biggest concern while planning for Thailand! Luggage space was my biggest concern when taking the train in Thailand because of our suitcase. I swear, I searched high and low for information about storage space but to no avail. While we could have kept our ginormous luggage at our seat, the staff attendant asked us to move our bags so that we can have more leg room. Yay! Well, I’m happy to tell you that the trains in Thailand are spacious! 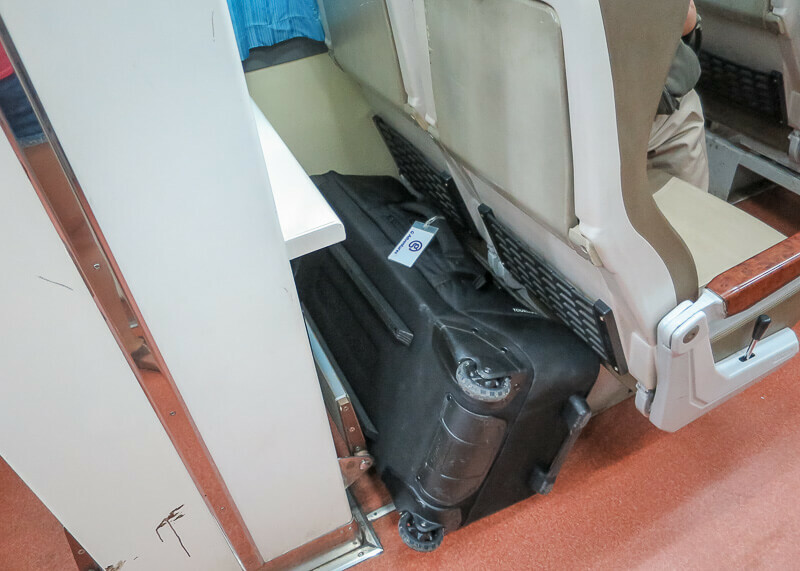 If you have a big suitcase that doesn’t fit near your seat, there’s always a few storage spots at the end of each carriage. Any other tips for taking the Bangkok to Ayutthaya train ride? Bring wet wipes for your hands and bring snacks for the train ride. 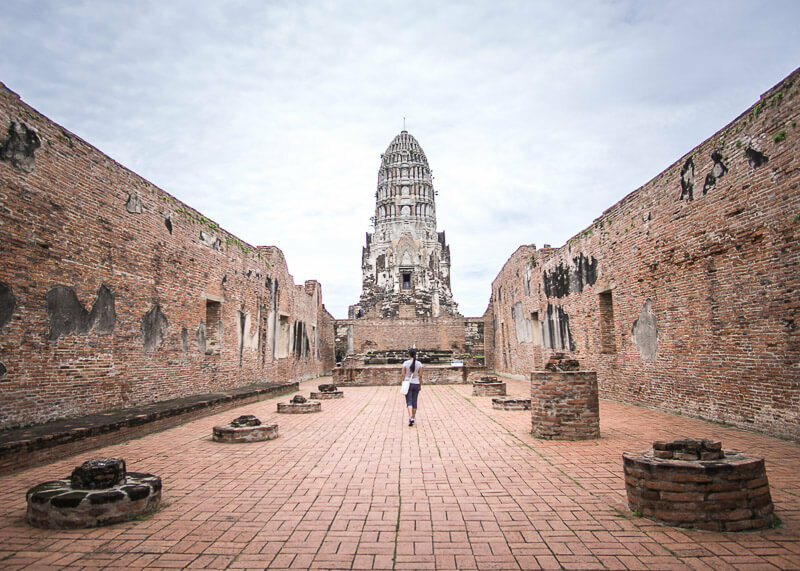 Have you taken the train in Bangkok or have you visited Ayutthaya? Is there any other information I should add to this guide? Comment below and share your experiences!